This strawberry mint fruit salad is a delicious recipe that makes a perfect side dish for any meal. 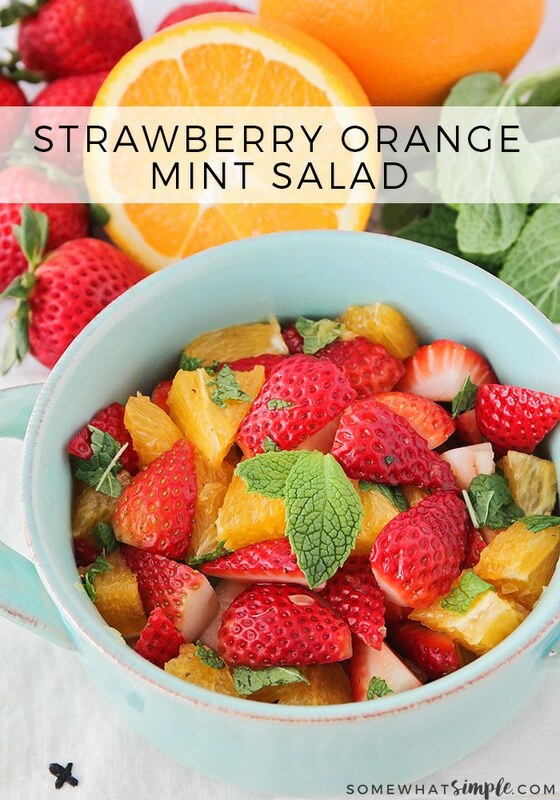 Made with juicy strawberries and oranges along with a dash of brown sugar and mint, it’s a refreshing salad you can enjoy all summer long. This salad is a simple side dish that’s perfect for a summer barbecue. 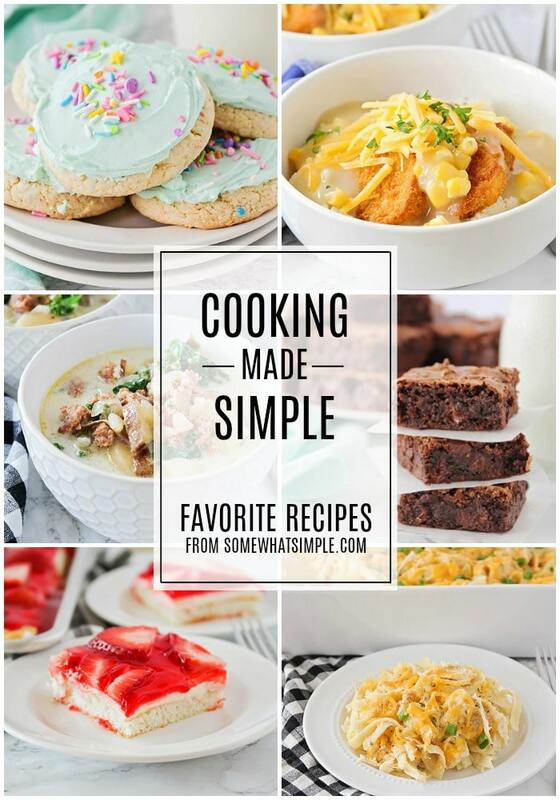 Some of my other favorite sides to bring are these Coleslaw, Potato Salad and Green Bean Casserole recipes. 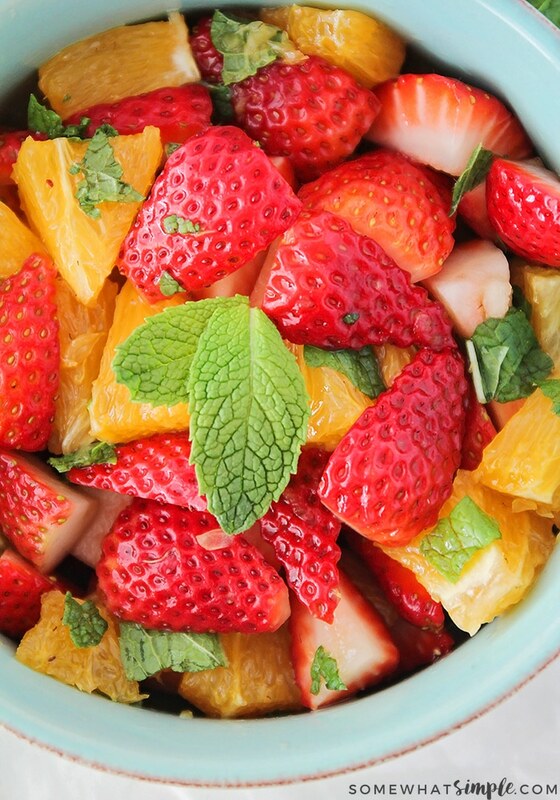 I love just about any kind of fruit in my salad, but this Strawberry Orange Mint salad has become a fast and easy favorite in our home. You only need a few ingredients, a little chopping board time, and in just a few minutes, it’s done! It’s a beautiful, colorful salad that has a unique, refreshing flavor! 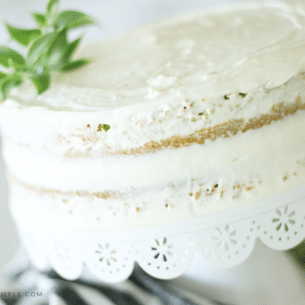 The addition of torn mint brings a nice freshness, the lemon juice brightens things up, and the brown sugar makes it just a little more complex. 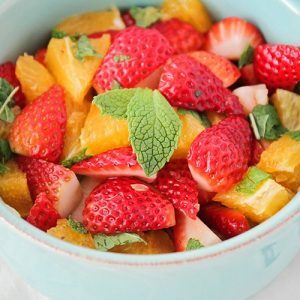 Whether you’re serving this fruit salad alongside eggs and toast for breakfast, or quesadillas for lunch and dinner, I hope this Strawberry Orange Mint salad is a welcome addition to your table. Leave us a comment below and let us know what you thought of this fruit salad or tag us on social media and show us all the fun you’re having during the summer! 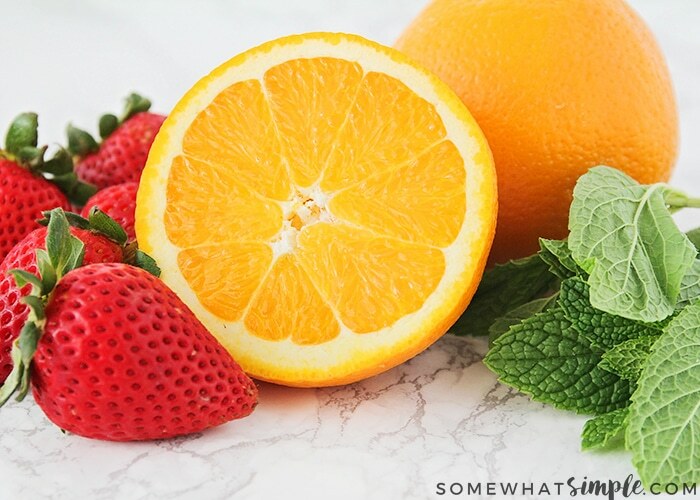 This Strawberry Orange Mint Salad is a delicious fruit salad recipe that is perfect for breakfast, lunch and dinner! Add the strawberries to a large bowl. Slice the stem end and the bottom end off the orange. Carefully cut away the rind of the orange, leaving just the center fruit. Slice the orange in half, then dice into bite size pieces, approximately the size of the strawberries. Add in the brown sugar and stir to combine. Once combined, sprinkle the mint and lemon juice over the top, tossing gently one final time. Serve alongside any meal of your choice, or enjoy alone as a great afternoon snack. Tear the mint instead of chopping it to avoid the mint turning dark in the salad. 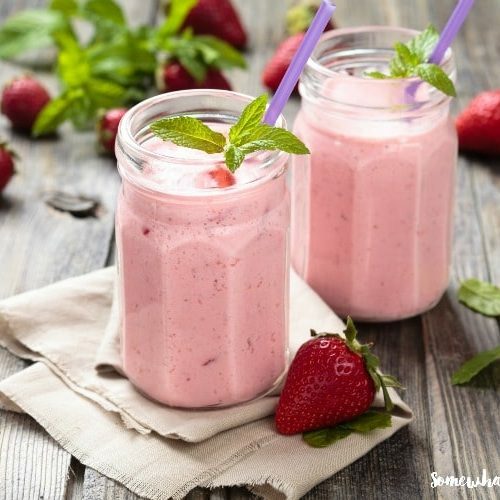 Having a big bowl of this waiting in the fridge is a great way to beat the heat! Love how simple yet perfect this is! Thanks Cathy, it’s one of my favorites! Looks so fresh and fabulous! Our whole fam will definitely love it, need to make this! 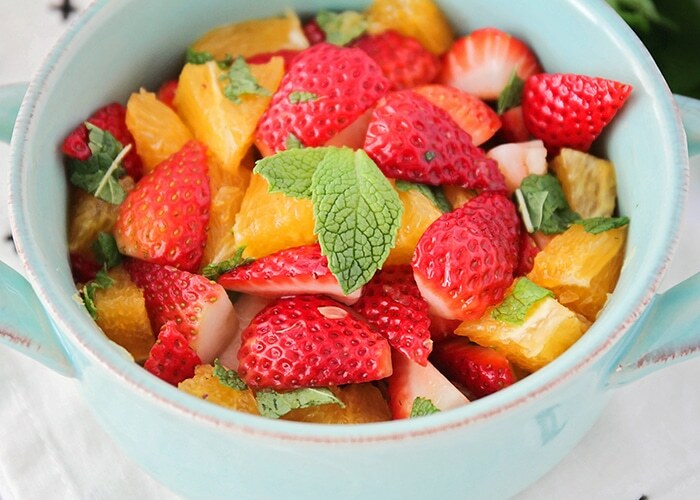 Such a gorgeous fruit salad!! I love strawberries! This is a recipe I must try! Love the idea of the mint I cannot wait to try this! 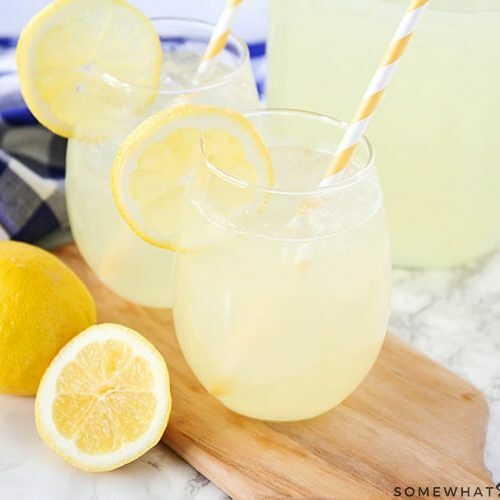 So vibrant and refreshing, sounds delicious!